Tej Pratap, who served as Bihar's health minister for 20 months till Nitish Kumar dumped RJD to ally with BJP in July 2017, recently tweeted a poster of his upcoming Hindi movie, 'Rudra - The Avatar'. PATNA: RJD chief Lalu Prasad Yadav's elder son and Bihar's former health minister Tej Pratap Yadav is busy practising rigorous physical exercises to gain six-pack abs as required for his role in an upcoming Hindi movie. The 29-year-old, first-time MLA has joined at a gym in Patna where he is trained by two experts for two hours each in the morning and the evening daily. Although he has set up a personal gym at his residence with many of the necessary equipment, he has been regularly attending the gym on Boring Canal Road for better practice and atmosphere. Tej Pratap, who served as Bihar's health minister for 20 months till Chief Minister Nitish Kumar dumped RJD to ally with BJP in July 2017, recently tweeted a poster of his upcoming Hindi movie, 'Rudra - The Avatar'. He is seen wearing a pair of sleek sunglasses in the poster. The only other photo of an actor in this poster is also his. "I am required to develop a strong physique for this movie, which is a political thriller with a lot of mythological links," said Tej Pratap, who earlier acted in a movie made in the local Bhojpuri language when he was a minister. In the 2016 movie, Apaharan Udyog, he acted in the role of a Bihar CM. But Tej Pratap does not have any role models in the movie world with a body he considers ideal. "I do not want to base my body on a John Abraham or a Salman Khan. I want to have a body that symbolises the immense power of Rudra, who is Lord Shiva," he said. 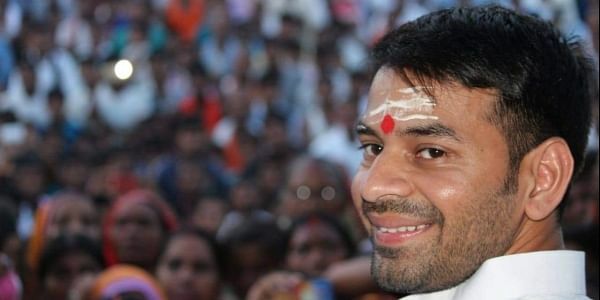 Tej Pratap has been an ardent devotee of Lord Shiva for years and keeps visiting temples regularly. 'Rudra - the Avatar' is likely to have an all-Bihari cast and a director from the state, and shooting is going to start in the next two months. Tej Pratap, who got married in May, is going to be the lead actor in this movie, said his aides. While his younger brother Tejashwi Yadav, also a first-time MLA who earlier served as Bihar's deputy chief minister, keeps busy in running the party, Tej Pratap finds time to pursue his hobbies. Tejashwi, 28, is going to be the RJD-led grand alliance's chief ministerial face in the state's next Assembly polls in 2020. "My wife, brother and everyone in the family is happy about my movie work. I have been an all-rounder. I will keep doing movies and stay active in politics at the same time," said Tej Pratap, who returned from Mumbai a few days ago after spending time with his ailing father. Lalu Prasad Yadav, a former Bihar CM who has been sentenced to over 27 years in jail after conviction in four fodder scam cases, underwent a surgery last month.